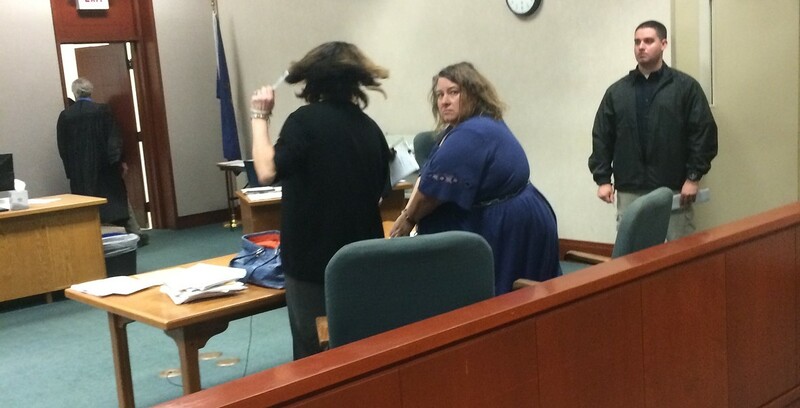 Alleged embezzler Lisa Peduzzi looks back during her arraignment in Chittenden Superior Court. A former Vermont Office of Risk Management employee cut 19 checks to herself that amounted to more than $60,000 in taxpayer money to fund the purchase of pistols and rifles, guitars, a used Subaru Forester, a 20-foot boat, an incubator for small birds, two rings, and her local property taxes, according to court documents. Lisa M. Peduzzi, 51, of Plainfield, pleaded not guilty to five counts of embezzlement and one count of attempted embezzlement on Monday morning in Chittenden Superior Court before she was released on $10,000 bail. When she was arrested outside her home last Friday, Peduzzi told Vermont State Police investigators that she "deserves whatever she gets and that she will pay back the state, even if it takes until she is 90," according to a Vermont State Police affidavit. Meanwhile, court documents provide new details of her alleged scheme, which Peduzzi told investigators was motivated by financial troubles. At one point the power company threatened to shut off electricity to her double-wide trailer home, which is now in foreclosure. Peduzzi resigned her position with the state in the early days of the investigation. During the arraignment, her public defender, Stacie Johnson, said Peduzzi had been hospitalized for a week earlier this month for mental health issues. The defendant sat quietly throughout the hearing, with her head bowed. Peduzzi and Johnson declined to comment as they left the courthouse. Peduzzi, who has no criminal record, faces up to 60 years in prison on the charges. "The evidence in this case is fairly strong," said the prosecutor, Assistant Attorney General David Tartter. "There is a good likelihood of a conviction." Court documents make clear that Peduzzi had allegedly been siphoning money from the state for two years without anyone noticing. The investigation was launched as a result of a recent transaction with an online commercial dealer who became suspicious and notified Vermont officials when Peduzzi tried to pay him with a state check. The scheme Peduzzi allegedly used was relatively straightforward. After identifying an item that she wanted to purchase, she created a false claim filed against by the state by an out-of-state person, approved the claim, had the "claim check" cut, then sent it to the seller of the item she wanted to buy. In July 2013, for example, Peduzzi wrote up a claim purportedly from Eduardo Busca of Miami, Florida. According to the fake claim, Busca had hit a large pothole while driving in Vermont, which caused serious damage to his custom rims and suspension, according to court documents. He sought $2,170 from the state. Peduzzi approved the claim and sent the check to Busca, according to court documents. When investigators contacted Busca, he told them he hadn't filed any such claim against the state; in fact, he'd never been to Vermont. He had, however, sold Peduzzi a Gibson guitar, for $2,170. Peduzzi told him that the check was coming from the state because she was drawing on her state retirement account to fund the purchase. Between 2010 to 2014, employees of the Vermont Office of Risk Management did not require supervision to create claims and cut check for them — as long as the claim was for less than $15,000, according to court records. That system changed in January, after which Peduzzi did not embezzle any more money, according to police. Is Anyone Watching Vermont's 6,000-Plus Charitable Organizations?